You might remember from last week’s post that, until last Saturday, I’d never been tailgating. I had, however, heard of the culinary lengths that people go to each week in preparation for a home game. The stories were all true! I actually made this chicken last week when my friends Adam and Cara came over for dinner, but it would be PERFECT at a tailgate or cookout – two things that are happening a lot this weekend with the fabulous weather we’ve been having! 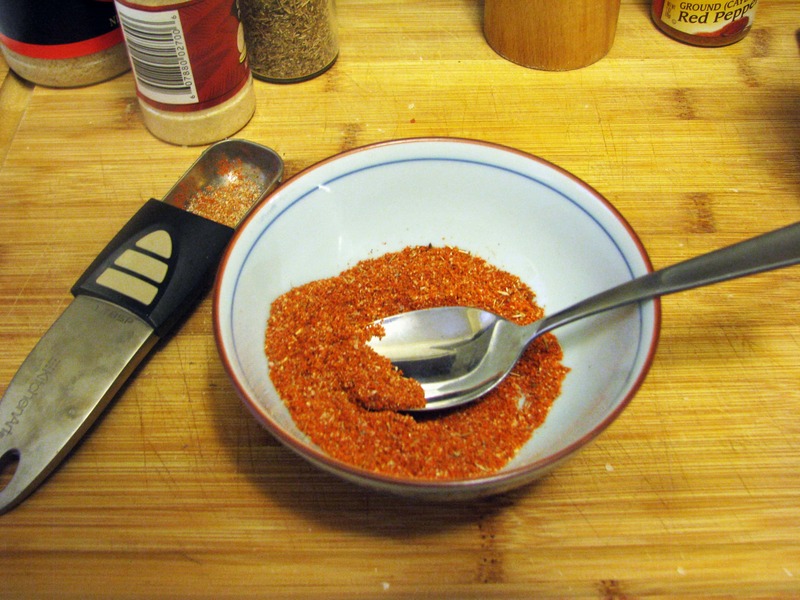 1/2 tablespoon cayenne pepper – more if you like things really spicy! In a very complex feat of culinary prowess, I dumped all of those things into a bowl and mixed them together. Now, I pan-fried this chicken because, as you know, I don’t have a dang grill. You could DEFINITELY grill this to enhance the blackened flavor, or cut the chicken into small bites like I do when I make Greek Chicken Bites, grill it ahead of time, and serve it with toothpicks at any event where bite-sized food is a requirement. I used three large chicken breasts which I sliced in half crosswise to make six thin pieces of meat. The reason for this is that thicker pieces take longer to cook and the blackening seasoning is more likely to burn, which isn’t too tasty. Also, the meat cooks faster if it’s thinner! 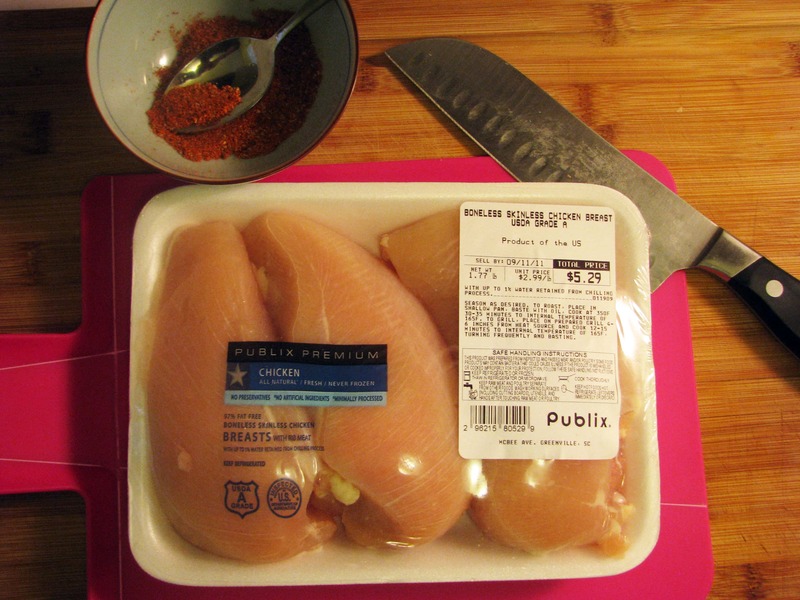 Now, this is important: Before you season the chicken, WASH YOUR HANDS. Why? Because you might not use it all, and if chickeny hands have gone into the seasoning mixture you can’t save it and use it again. And that’s wasteful and wasting is stupid because you BOUGHT THE SPICES so you may as well use them, right? 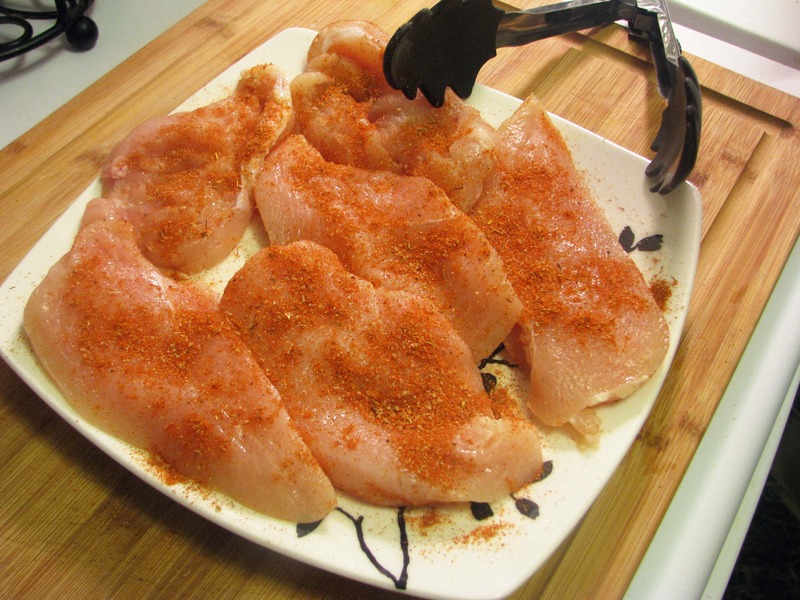 Once your hands are clean, sprinkle the seasoning all over one side of your chicken. Then, using tongs, flip the pieces over and season side 2. Don’t use too much – you’re not making a crust here. If you can, let the chicken sit and meditate on its eminent searing for an hour or so. If you don’t have that kind of time, heat up a big pan or grill with some olive oil to medium – not too hot, we want to cook the chicken all the way through without burning the spices. 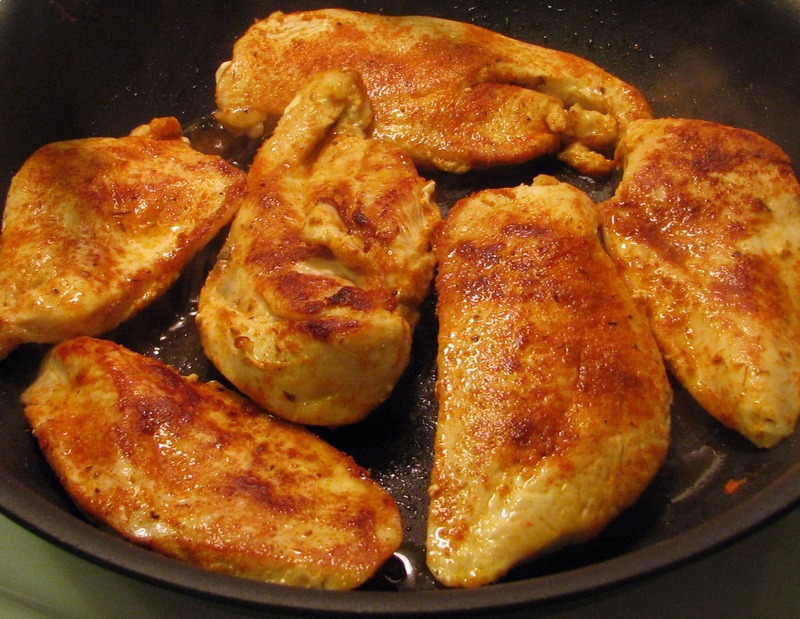 When the grill or pan is hot, throw the chicken in – it should sizzle! Let the chicken cook on the first side for 5 minutes or so – until you can see white cooked meat around the edges. Then flip it over. Nom nom nom. See how golden but not black the spices are? That’s exactly what we’re looking for. 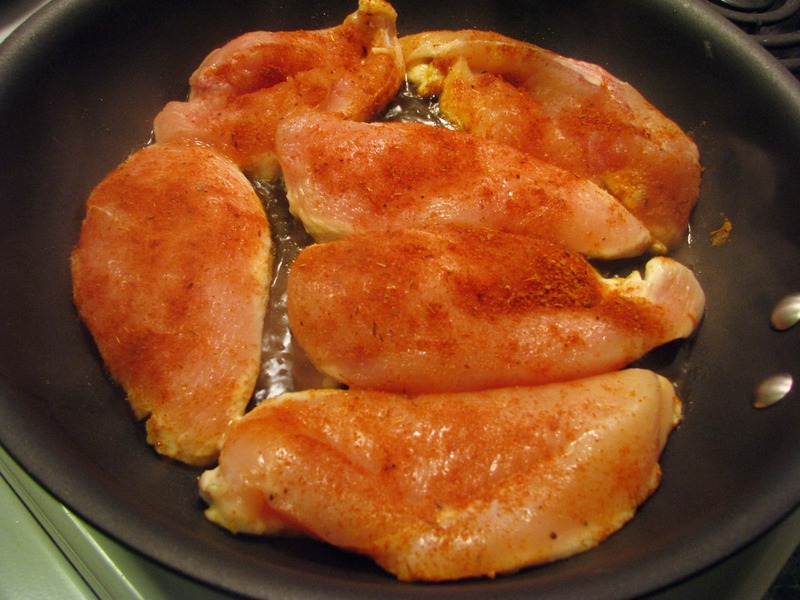 You might flip it over once more to finish cooking it through and be sure the sides are evenly brown – for breasts 1-inch thick you’ll need about 10 minutes of cooking time. Make a little slit in your thickest piece of chicken to see if it’s cooked through – white and juicy is what we’re going for! 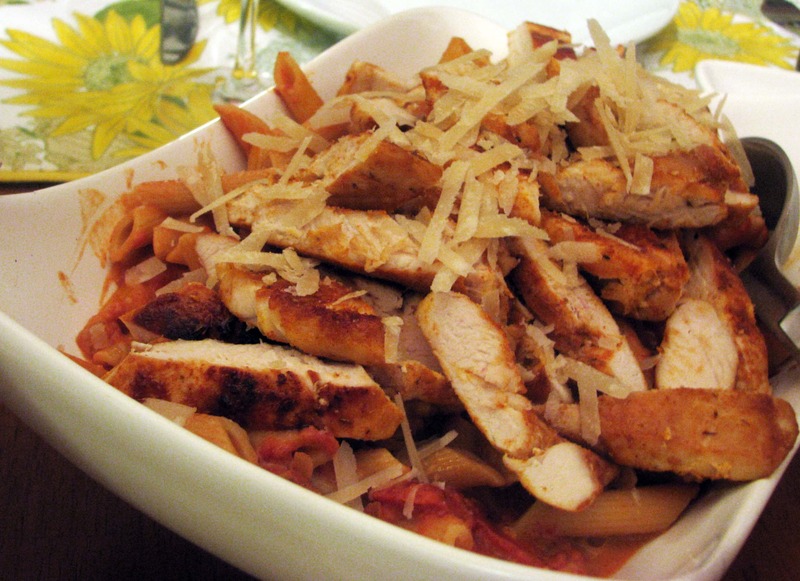 When I made this last week I sliced the chicken and served it on penne with vodka sauce, which we will discuss in detail soon. It was very delicious, but this chicken would be SO good sliced over a salad or as a sandwich. 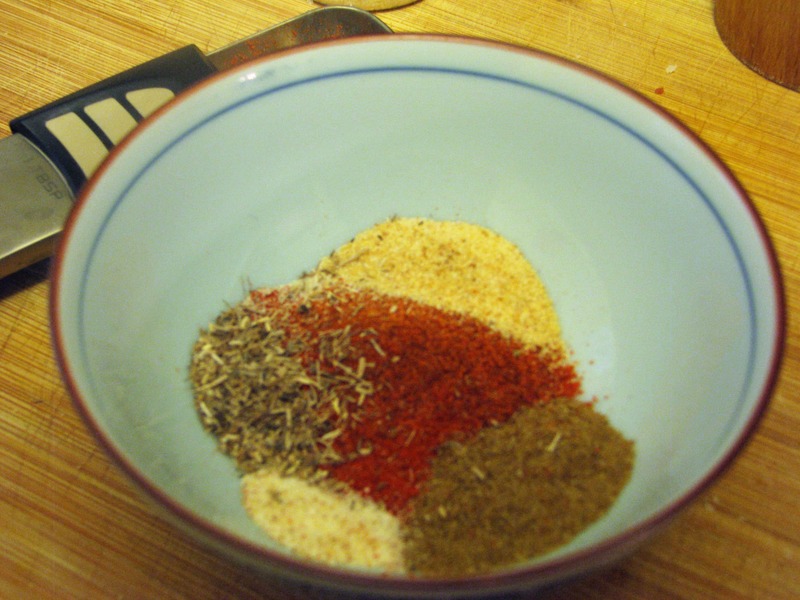 This is easy, healthy, and goes great with everything. Enjoy!